Epic piano sonata becomes religious ritual. Do you remember that scene where the guy went up to the piano all in black with that look in his eye, and for the next three hours he stared and grappled and coaxed the instrument into submission? If that piano were a pig, it would know who was master by now. I've never seen such intensity and commitment to any act. It was spooky and comforting. Was it a sonata or a psychodrama? The music wasn't hard to listen to; it was like a gothic ritual. Not in the light of day but in a private corner of some dungeon. In the piano Olympics, Violette is a gold medalist. That discipline sharpened at Juilliard, the Benedictine monastery, and the leather world have served him well. We are spellbound. Time and space have now been redefined. Monumental chord blocks and swirling filigree, but also a hefty measure of contemporary dissonance and angularity…somewhat spikier than typical Minimalism… It demands a lot of a pianist. Mr. Violette, a composer-pianist in the tradition of Busoni and Sorabji, had sufficient energy and virtuosity for this marathon. Violette is a Brooklyn-born, Juilliard-trained musician and composer who also spent 8 years as a Benedictine monk; he is photographed bald, in leather, and holding a whip on the covers of the accompanying booklet. Hence, he defies easy categorization, and so does this music - which, to a certain extent, also defies description. As I listened to Sonata 7, composed in 2001, I thought frequently of some of the organ music of Olivier Messiaen as well as some of the techniques of Philip Glass and Steve Reich, but it is different from all of these. To say the least, it is a fascinating work: it has minimalist repetitions; it is at times mystical, almost tantric, often mesmerizing. It also has lively dance rhythms and loud tone clusters, and at times it impresses as a wave or mass of sound color washing over the listener and into the ears. It is modern, but there is little dissonance or any of the various other characteristics we associate with that term. Although composed in 26 movements, subdivided into two sections after No. 13, it is not merely a collection of short pieces in the style of a suite. It is a single, coherent work in the traditional sonata-form structure, with all its various elements interrelating, as the booklet's extensive and detailed analysis, by musicologist/pianist/composer Bruce Posner, points out. There is also an introductory note by composer/author Mark N. Grant that attempts to describe the work; he relates it to Beethoven's Diabelli Variations and "Hammerklavier" Sonata as well as to Kaikhosru Sorabji's Opus Clavicembalisticum , and this heritage is by no means far-fetched. It is most emphatically a phenomenal and a prodigious piece, and also one that easily bears repeated hearings and their inevitable discoveries and revelations, even though each one requires a significant investment in time. This fact will probably ultimately be the single greatest deterrent for this CD to become a hot seller or for the work itself to be frequently programmed in the concert hall. It is perhaps unfortunate, for there is much here to relish and enjoy. 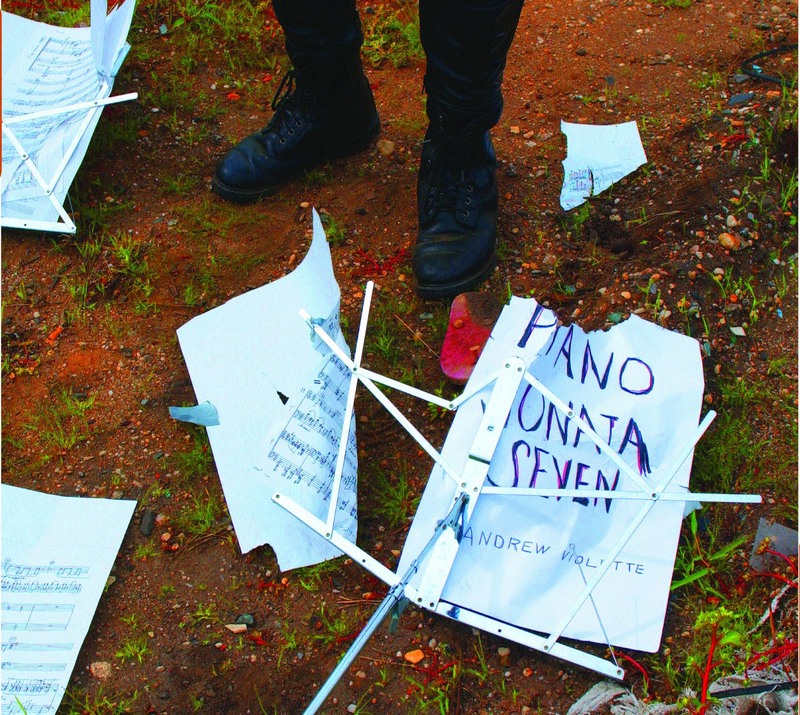 Embarking on Andrew Violette's Piano Sonata 7 is as thrilling as it may seem daunting. Clocking in at around 3 hours, the piece begins at a slow, digestible pace, understatedly majestic and somber. It wavers between very personal utterances and extroverted proclamations-it can be said that this is the blueprint of the entire piece. It moves from the first Adagio into a fast paced dance section, expanding on its quasi-tonal language. A cinematic jump cut gesture that later becomes a cadence is used to suddenly transition into the spiraling Chaconne. This pluralistic approach propels the work, as thematic areas and sonorities get reincarnated Violette's approach allows his materials to naturally spore and spate. Three hours may sound extreme to some, but it is a journey worth taking, even when factoring in the final disappointment arising from a desire for the piece to continue after it has ended-really! For contrast, Violette's short and serial Sonata 1 appears after 7's conclusion.